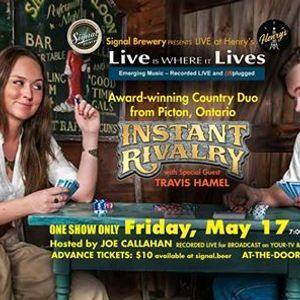 Join us for a live recording of Live is Where it Lives at Henry's, next door to Signal Brewery, produced for television by YourTV and for radio on 91X Loyalist College Radio. 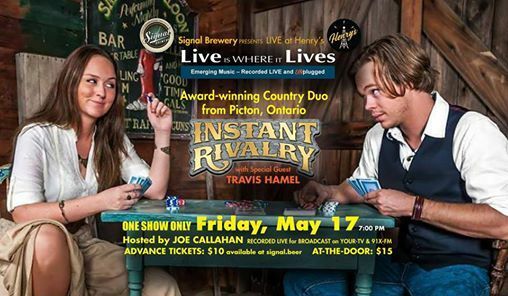 Friday, May 17 we're excited to present brother and sister duo Instant Rivalry. Caleb and Megan Hutton started playing music together as Instant Rivalry (IR) while attending high school. The Highway – a track off their first album – remained on the independent charts for nine weeks, peaking at number two and received international radio play. Hosted by Joe Callahan the show will be recorded for broadcast on Cablevue throughout the Quinte region and on 91X Loyalist College radio Sundays from 12:00-2:00pm.